Ever since Vivaness 2018 trade show I’ve been waiting for organic Brazilian-German makeup brand Baims to be launched over here in Germany; and now that day finally has arrived! 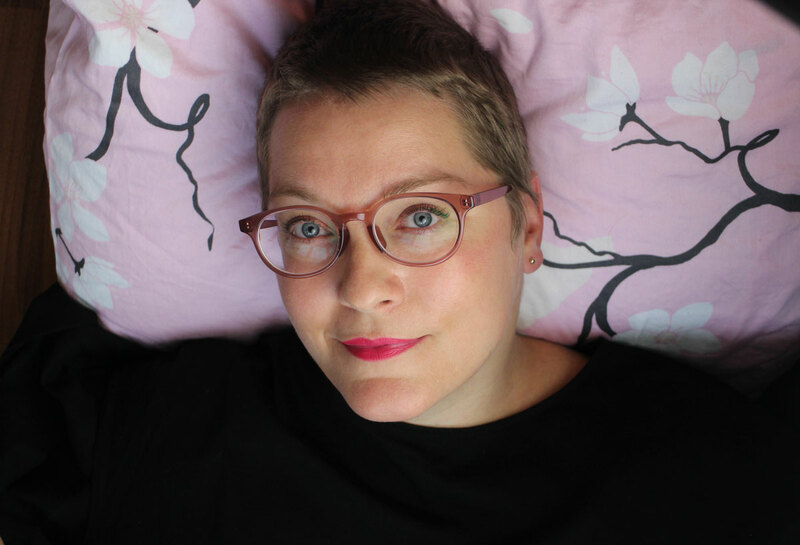 Anne Schaaf from online store Wolkenseifen is one of the first German retailers to sell Baims Natural Makeup in her online perfumery and I was very glad when she approached me for this Sponsored Post. And now let me introduce five key pieces from the Baims Natural Makeup range. The company was founded in 2015 by Luisa Baims-Albrecht and her husband Bernd. Luisa comes from Brazil – she used to work for one of the domestic TV channels – and discovered organic beauty then in Germany. 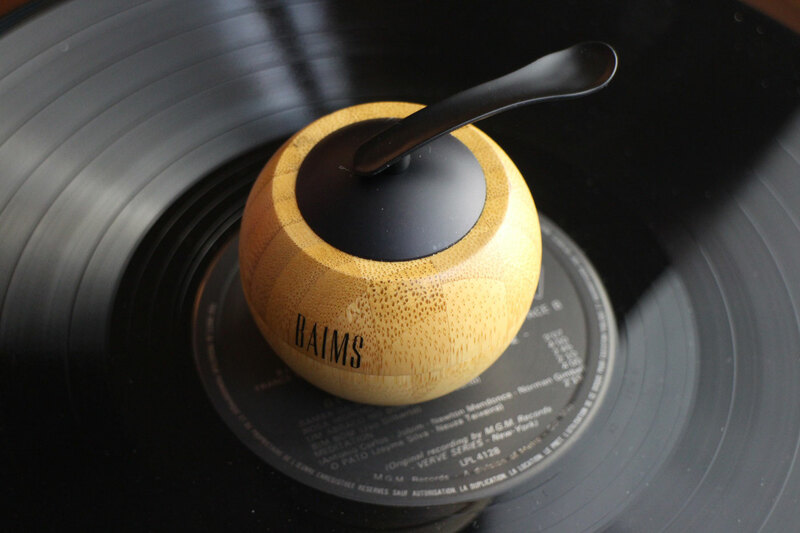 The first Baims products were launched in Brazil in 2016 – and this year the brand is finally coming to Germany! The portfolio of Baims Natural Makeup is large; when I was shown the brand at Vivaness I could barely keep up: there are liquid and creamy foundations, liquid concealers (with a pleasant texture and good coverage), several pressed powders, a highlighter, a bronzer (suitable for contouring), blushes, powder eyeshadows, a mascara, lipsticks and lipglosses. All products are vegan and certified organic by Ecocert. All Baims products are formulated with moisturising plant-based Pracaxi oil complex – it was very important to the founders that their beauty products also nourish the skin rather than just merely adding colour to the face. And I really like Baims‘ packaging concept: powders, eyeshadows, lipsticks and the cream foundations are refillable. The jars are made from bamboo which grows very quickly – doesn’t the packaging look amazing? I especially love the ball-like jar of the Cream Foundation. And this is also the first of my five key pieces! 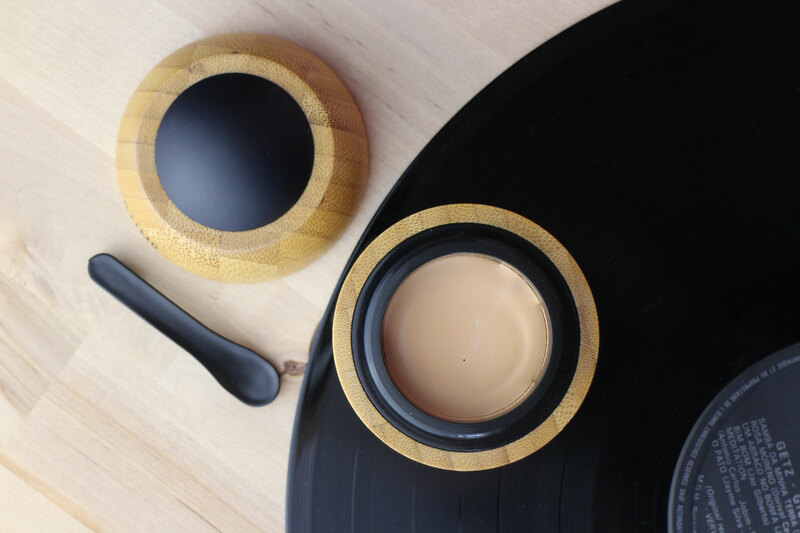 The Cream Foundation from Baims won one of the Best New Product Awards at Vivaness trade show this year – and the circular design of the foundation jar is indeed eye-catching! The pack includes a small spatula which is magnetised at one end and sticks to the lid of the foundation jar – such an original detail. See picture above. Once you unscrew the upper part of the ball and remove the lid inside you can see the cream foundation. The jar comes with a firm applicator sponge and there are three foundation shades: Macadamia is light with yellow undertones, Pine Nut is a light to medium shade, neutrally tinted with light peachy tones and Walnut – the darkest shade – doesn’t actually look that dark inside the jar: I would describe Walnut as a light medium colour with yellow-apricot undertones. The foundation has a water-free texture. Use the spatula to scoop out a little amount and then apply it to the face with a brush or sponge. You can layer the foundation to achieve a pretty high coverage. If you want less coverage you only need a small bit of product. Once the foundation is on the skin the smooth pliable cream texture turns into a powdery finish. I still use an additional mattifying powder on my T-zone. If you have larger pores or dry patches on your skin I recommend a primer: Baims will soon launch a new primer which I already tested at Vivaness. I was fascinated by the almost silicone-like smoothness of the texture although the primer does not, of course, contain any silicones! The Cream Foundation is based on titanium dioxide, silica and jojoba oil; it is fragrance-free. One jar of Cream Foundation from Baims Natural Makeup contains 30ml and costs 53.00 Euro if you order it through Wolkenseifen. The Baims range offers three Eyeshadow Quad Palettes with a total of 12 powder eye shadows. Each individual eyeshadow is also available as a refill. The palettes contain a mirror on the inside of the lid and have a magnetized closure. The palette also comes with a two-sided applicator. 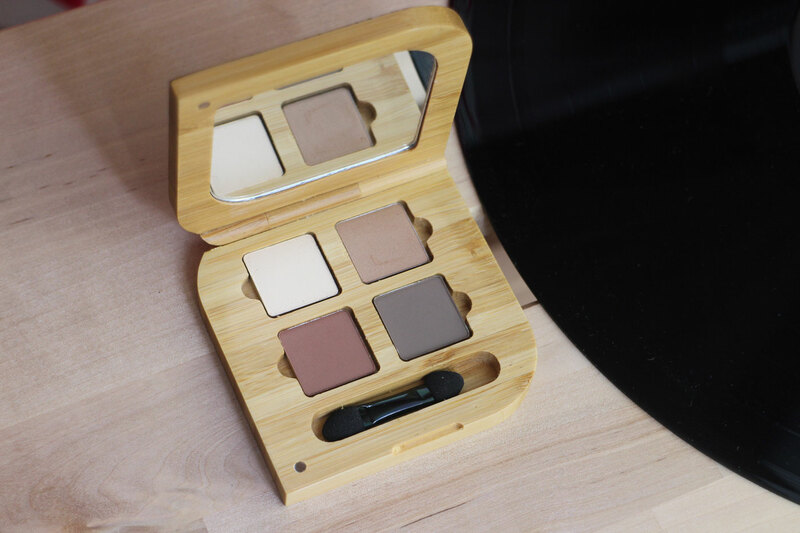 I like the colour combinations of the Eyeshadow Quads: my favourite is the Eyeshadow Palette in Naturelle which contains the colours Ivory, Luna, Chocolate and Brown (more about those shades later). The Quad Mother Earth contains mossy-brownish shades while the Quad Melody offers a stronger contract with pink and anthracite. 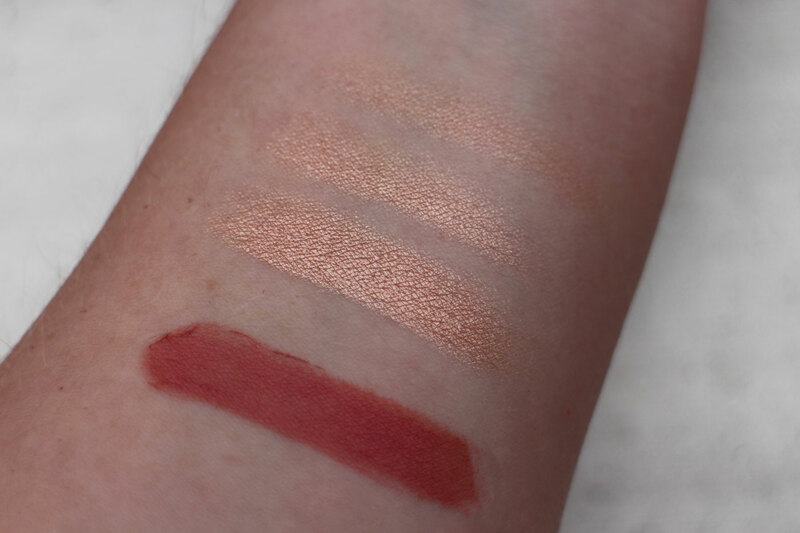 And here are the swatches of the Eyeshadow Quad in Naturelle (the picture looks a little too warm on my computer screen): Ivory on the far left is a matte cream white which is a good base or can be used for blending. Next to Ivory is Luna which is a light brown with apricot undertones and subtle golden shimmer particles. Chocolate is difficult to describe: it’s a medium-toned brown with dark red undertones. And Brown is a dark, neutrally-tinted greyish brown. Except for Luna, all eyeshadows in this quad palette have a matte finish. The texture of the eyeshadows is silky, when you take up the colour with the applicator it crumbles very lightly in the pan but on the lid the colour is easy to distribute. 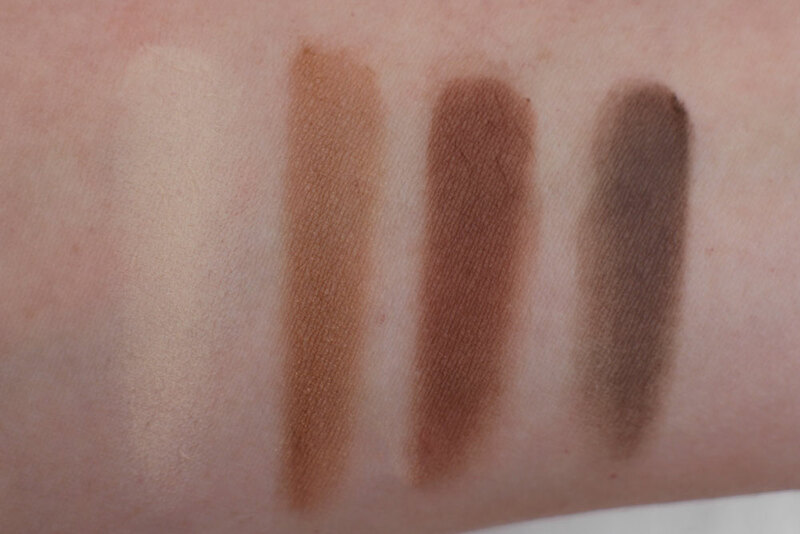 The pigmentation of these four eyeshadows is medium so you can create natural but also more dramatic looks. Without a base the eyeshadows started to fade a little after 4-5 hours, with light creasing. The eyehadows are based on glimmer, corn starch, zinc stearate and squalane, they are fragrance-free. Of course I also liked other colours in the eyeshadow range, like the light beige-grey Taupe in the Mother Earth Palette – well, you know how much I love taupe colours 😉 . One Eyeshadow Quad Palette from Baims contains 5gr and costs 39.00 Euro at Wolkenseifen. Ok, I can totally describe this highlighter in one sentence: Brazilian summer in a powder compact! A warm glow which is perfect for soft summer evenings… This colour really makes me swoon, although I was a little sceptical at first when I tried out the product at Baims‘ Vivaness booth: isn’t it a little too much glow…? But no, definitely not because the Highlighter Pressed Powder from Baims has a wonderful rosé golden shade which contours the face beautifully – you can see the colour but it still looks natural. Of course you can also use a lighter dusting of powder for an all-over, more subtle glow. What makes this highlighter so remarkable is the whispery-light yet still buttery-soft texture and the high load of shimmering colour pigments (there are no large glitter particles!). The rosé-apricot shade warms the skin and looks very flattering. On the swatch you can see the highlighter in three intensities (underneath it is a swatch of one of the lipsticks, more on that further down). I apply the highlighter on the upper part of my cheekbones and underneath the browbone – the combination of these two highlighted facial areas looks very summery. The highlighter is based on glimmer, processed oils and corn starch; it is also fragrance-free. I have already tried out the highlighter as an eyeshadow and that works well, too – a true all-in-one product! If I had to choose one single product to use this summer it would be this highlighter – ok, and also a mascara 😉 . 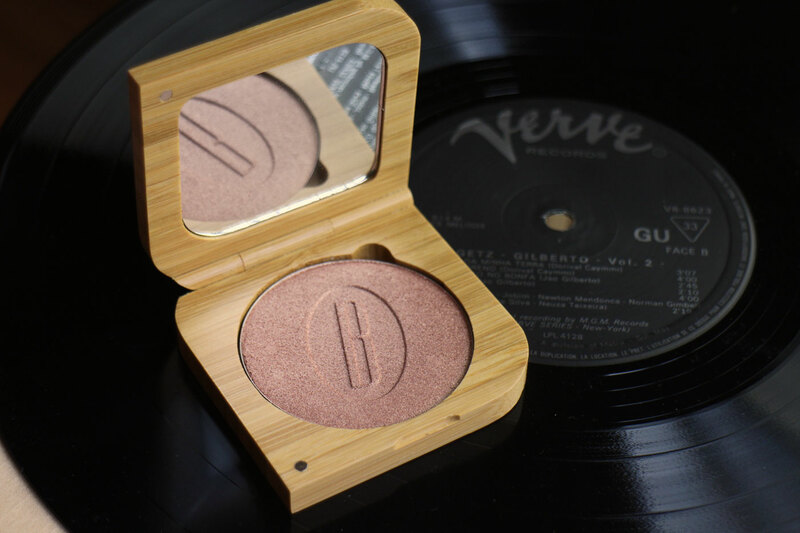 The Highlighter Pressed Powder Warm & Glow contains 9gr and costs 30.00 Euro at Wolkenseifen. 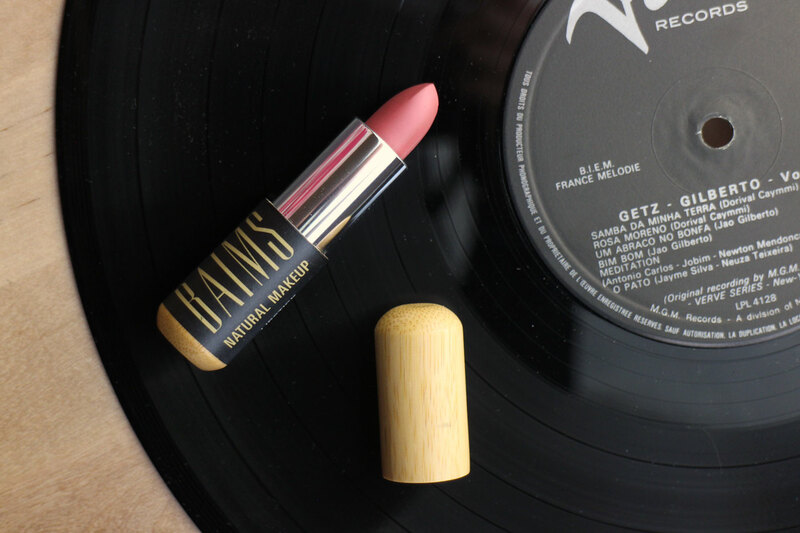 The lipsticks from Baims are vegan, just like all the other products. The lipstick range offers eight shades; I first searched for a neutral to cool-toned colour but in the end I decided against Berry (a fuchsia-tone berry shade) and Suede (a muted dusky pink) and selected Guava: you have seen the Guava swatch on the highlighter picture above. I would describe the colour as a slightly warm, strong peach-coloured pink; on my lips Guava looks a bit cooler than on the swatch above. The lipstick is highly pigmented and a single layer already offers good coverage. The finish is matte to satinised and the texture of the lipstick – which is based on castor oil and apricot kernel oil – is smooth and creamy; with a very light powdery scent. 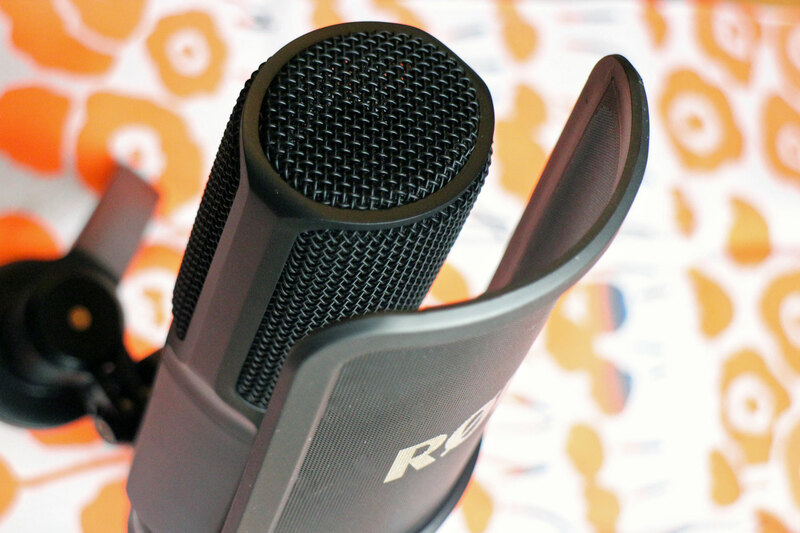 It feels comfortable on the lips and is quite hdrating. It lasts for an average length of time; I like it that the lipstick fades evenly. I can also imagine wearing the shade Lush this summer – and then, of course, Berry in autumn time! One Lipstick from Baims contains 4gr and costs 25.00 Euro at Wolkenseifen. The Mascara My Lashes from Baims is available in exactly one colour: black. And when I write black I mean deepest black – I’ve never seen such a dark colour on my makeup remover pad when I take off my eye makeup in the evening! The iron oxides are probably responsible for this intense hit of colour – they are listed in second place in the INCI list, after aloe vera juice. 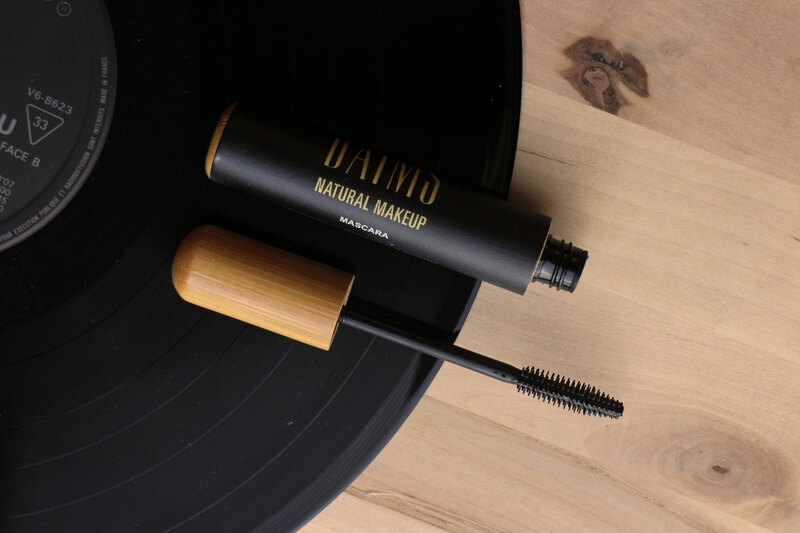 This is no mascara for a subtle look – your lashes will be deep, dark black! The texture of the mascara is liquid rather than waxy. The applicator has alternating longer and shorter bristles which transfer the colour well onto the lashes – I almost got too much colour the first time I tried out the mascara. My tip: don’t use much pressure when you apply the mascara, simply brush the applicator along the lashes. I recommend two thin layers; if you want a natural look one layer is sufficient. The macara dries quickly and lasted well. It also survived a few tears but not a major crying attack (the lengths I go to to test out stuff for you 😉 ). The mascara make the lashes look more dramatic, it accentuates rather than enlongates; at least on my lashes. And removing it was easy, I simply used my usual micellar water. The Mascara My Lashes from Baims contains 10ml and costs 25.00 Euro at Wolkenseifen. There are new beauty products to discover? Wonderful! 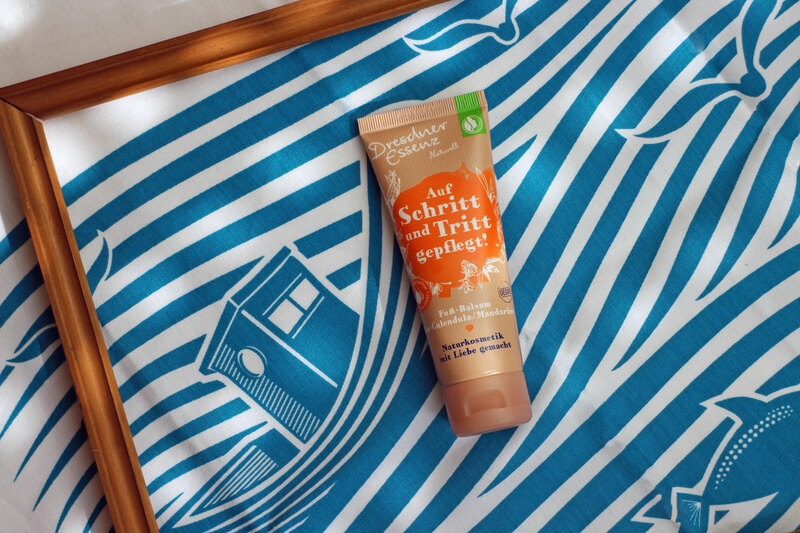 When German organic beauty brand Dresdner Essenz approached me for a Sponsored Post about their summer 2018 launches I immediately knew the kind of format I wanted to create for this article: window shopping! Hence the idea for a picture frame 😉 . But first here’s some background information on the company. If you live in Germany you are probably familiar with Dresdner Essenz: it’s a well-known bath care brand whose origins go back all the way to the early 20th century and the Eastern German city of Dresden. In 1910 Richard Carl Pittlik launched the Deutschen Arzneimittelwerke Li-iL (German Medicinal Products Factory) in Dresden and developed the first clinically-tested natural bath essences to treat various skin problems and even illnesses such as rheumatism. After World War 2 – Dresden happened to be located in the Soviet Union-dominated part of Germany which then became the German Democratic Republic – the company continued to exist although it was nationalised (state-owned) in the 1970s. After the Berlin Wall fell in 1989, family-owned company Holtsch Medizinprodukte GmbH from the city of Taunusstein took over Li-iL and in the 1990s introduced the Dresdner Essenz brand because the Holtsch owners had a personal connection with Dresden. In 2016 Dresdner Essenz launched the certified organic beauty sub-brand Dresdner Essenz Naturell – the products are certified by Natrue and the entire product range is vegan (I have written about the brand here). Dresdner Essenz is a brand with a lot of history and tradition – and today the company’s headquarters in Dresden are located in the same buildings that the Deutsche Arzneimittelwerke Li-iL occupied back in the early 20th century. They also have a factory sales outlet and next time I’m in Dresden I am definitely going to visit the store 😉 . Just sitting near the water, looking out over the sea. Not doing anything, watching time go by; smelling the wooden planks of the landing stage and feeling the warm summer air caress the skin. This mental image was probably the inspiration behind the development of these two new bath additives and the shower gel from Dresdner Essenz Naturell – all three products are scented with organic coconut and lime. ♥ The Naturell Hydrating Shower Fühl dich wohl! has a clear texture which is neither to thick nor too liquid. Once it comes in contact with water the shower gel turns into a milky cream. The fragrance is a subtle and natural blend of coconut and lime (no wonder that the packaging says „Not for eating“ 😉 ). In addition to coconut sulfates and sugar tensides (as cleansing actives) and moisturising sesame oil and aloe vera, the ingredients include coconut water and essential lime oil. After the shower the fragrance clings to my skin for a short while. The tube contains 200ml which cost 3.99 Euro (available in DM drugstores). ♥ The bottle of the Naturell Foam Bath Das ist Urlaub! is made from 100% recycled plastic. The liquid bath additive has a golden-yellow colour, you need around one cap full for a bath tub – if you pour the foam bath directly into the running water it turns into a surprisingly stable foam (quite unusual for an organic foam bath; I like!). I also like the fragrance: the bath water smells more exotic than the shower gel – yes, there are notes of creamy coconut and lime but at the same time my nose also detects cooler notes (the INCI listing includes menthol) and an exotic floral accord. The perfect summer bath! The bath additive also contains coconut sulfates and sugar tensides which cleanse the skin (and are also responsible for the wonderful foam) while sesame oil and aloe vera hydrate the skin – my skin didn’t feel dry at all after my bath. One flacon of the foam bath contains 300ml which are sufficient for 8-9 baths. The bottle costs 4.49 (available in DM drugstores). 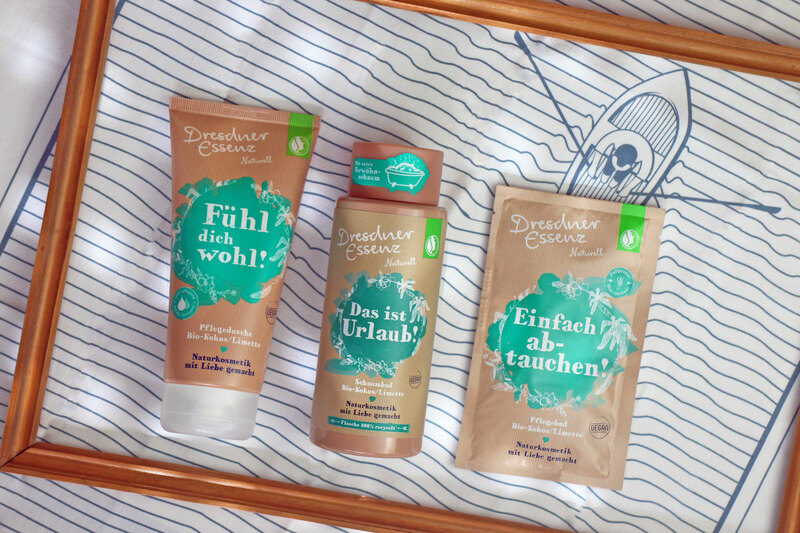 ♥ I really like sea salt bath additives because my skin loves them, so I was delighted to see that Dresdner Essenz Naturell’s new coconut-lime summer range also includes the Naturell Moisturising Bath Einfach abtauchen! The bath salts are packaged in a sachet; they are based on sea salt plus mineral-rich chalk (which turns the bath water a little whitish), some coconut sulfates, coconut oil and sesame oil. My rather dry body skin really likes the combination of salt and oil because it offers both minerals and lipids. The fragrance combines powdery coconut milk and just a hint of citrus. A sachet with 60gr costs 1.49 Euro (available at DM and Rossmann drugstores). ♥ For me summer time also means a high consumption of foot cream because I love wearing sandals! And with these kind of airy shoes you simply need smooth and moisturised feet. The Naturell Foot Balm Auf Schritt und Tritt gepflegt! (the name translates as: Moisturising Your Feet at Every Step!) has a fresh herbal fragrance which combines rosemary, menthol and mandarine – it’s also good if your legs feel heavy and tired. The texture is not too thick and balmy but comparatively light; the foot balm is quickly absorbed into the skin without leaving it greasy. Thanks to tapioca starch which is also included in the product formula my feet almost feel a little silky. Over the past weeks it was occasionally warm enough to wear sandals so I used the balm as my morning foot care product. Besides water the Foot Balm is based on a plant-based emulsifier, moisturising glycerin, avocado oil, coconut oil and sweet almond oil, plus soothing calendula extract. The tube contains 75ml, costs 3.49 Euro and is available in stores of drugstore chain DM (there is also a matching fizzy foot bath). ♥ Dresdner Essenz Naturell also has a new lip care balm: the Lip Care Stick Zarte Lippen Sollst Du pflegen! (roughly translates as: „Soft Lips Must be Moisturised“) is packaged in a bright red sleeve and is based on plant oils and waxes, especially on olive oil and the berry wax of the rhus verniciflua tree (also called Asian lacquer tree). I was interested to see that the INCI list also includes aronia berry extract which immediately made me think of Dresden: although the red aronia berry is primarily cultivated in Russia and Canada, the biggest aronia growing region in Europe (since the 1970s at least) is actually in Saxony’s Elbe Valley (which also happens to be the region that Dresden is located in). So the aronia fruit really is the perfect match for Dresdner Essenz! The texture of the lip balm stick is balanced between waxy and oily (perhaps slightly more oily and less waxy than a balm formulated with beeswax). 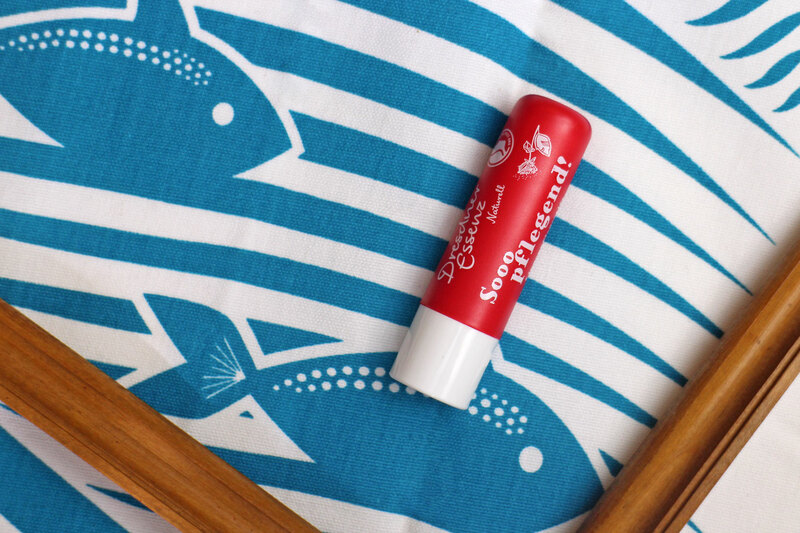 For my super demanding lips the Lip Care Stick is the ideal day-time product (at night I need a more waxy moisturiser). The lip balm stick contains 4.8gr and costs 2.99 Euro (available in stores of the DM and Rossmann drugstore chains). And of course you can also order all the new Dresdner Essenz Naturell products in the company’s own online shop. Exactly two weeks ago I was in Amsterdam to visit raw ingredients trade show In-Cosmetics Global, checking out innovative ingredients and exciting new beauty trends. Some of these trends I will now present here although it was of course impossible to visit all exhibition booths at the show – there were over 800 exhibitors. Although I was looking for beauty trends in general, my main focus were raw ingredients in the organic beauty sector. I also noticed that many of the exhibitor companies seemed to prominently feature „green“ ingredients amongst their new launches – organic beauty is an international mega trend (and hopefully more than that). I already wrote about how I spent my time at the show in this Amsterdam Diary here (German only, sorry). First I’ll present a few selected trends which I kept seeing at different exhibition booths. One of the key topics that was visible all over the trade show and at workshops was microbiomes: how can cosmetics support the skin’s own bacterial flora so the skin stays healthy and resilient? It is an issue that is currently the subject of many scientific and clinical research studies, often with a focus on probiotic and prebiotic ingredients. 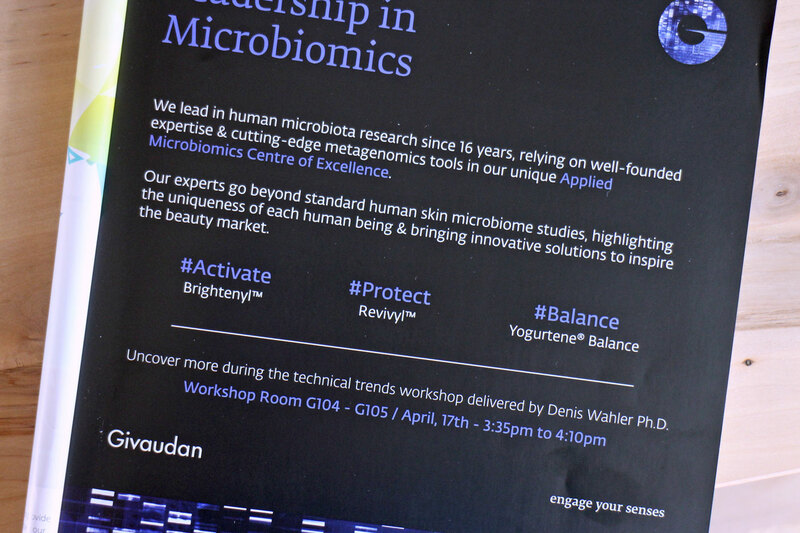 Swiss company Givaudan, for example, presented their ingredient Yogurtene Balance; other examples were Biotylis from Greentech, Ecobiotys from Silab or Actibiome from Codif (Codif even sponsored a big workshop on this topic which sounded really interesting). Protecting skin from the so-called blue light was another key topic at In-Cosmetics. Last year I wrote about the Face Oil 3in1 from Annemarie Börlind which contains antioxidant lutene derived from the tagetes plant. Lutene has the ability to absorb blue light rays that are, for example, emitted by computer or smartphone screens. 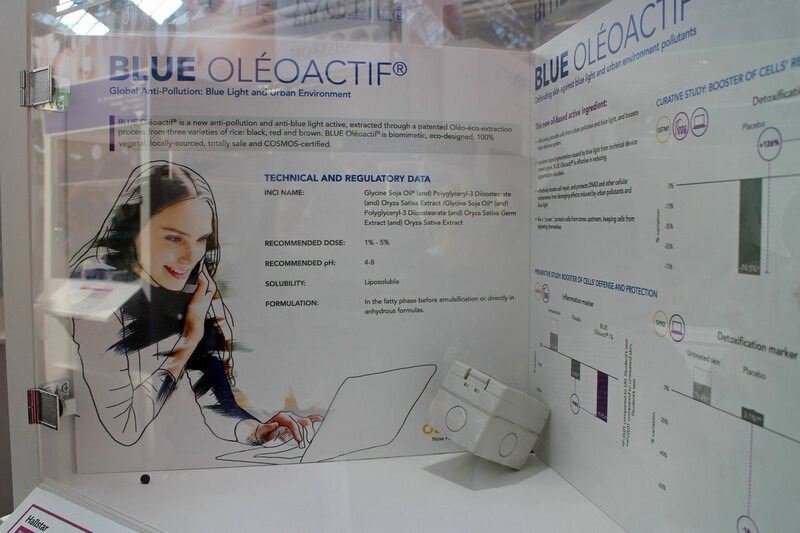 At In-Cosmetics I noticed other ingredients that protect against blue light: on the picture above you can see Blue Oléoactif from Hallstar (manufactured from rice); I also discovered Energinius von Gattefossé (from ginseng), Alpha-Lupaline from Expanscience (from wheat germ and lupine), Marine Bamboo TG from DKSH (derived from algae) and Sakadikium from Seppic (made from the root of white ginger, a plant that belongs to the ginger family). As a short side note: whenever I hear the keywords „microbiomes“ or „blue light“ I immediately think about „anti-pollution“ (ingredients that protect skin from environmental damage). Portuguese company Inovapotek has developed some new methods to make these effects more measurable – although In-Cosmetics is primarily a raw ingredients trade show the exhibitors also included companies offering various services to the cosmetics industry. Regulating sebum might not sound as exciting as microbiomes, anti-pollution or blue light but there is a still a strong customer demand: these are ingredients that are used in face care products to help regulate the skin‘s sebum production and prevent excessive shine or oiliness on the skin. 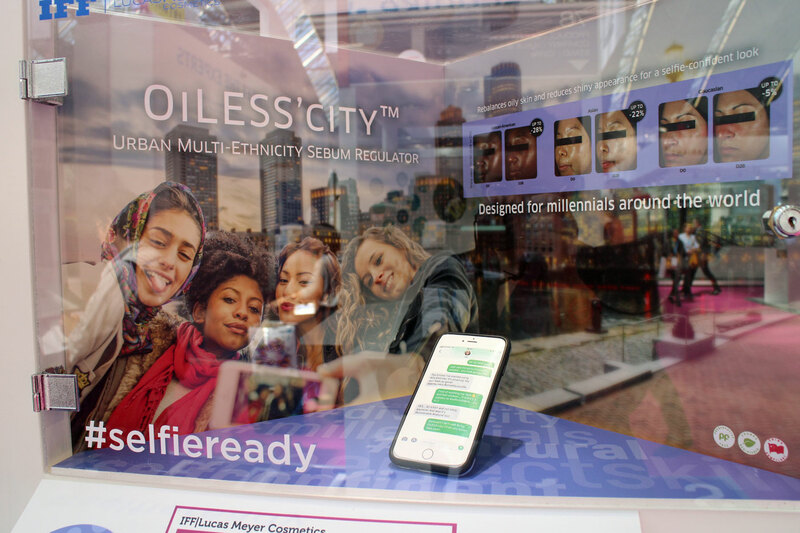 A very hip-sounding ingredient was Oiless’City from Lucas Meyer Cosmetics (made from lemon myrtle) which was presented together with the hashtag #selfieready. Rahn’s ingredient Seboclear MP (derived from a mulberry plant) recently won the Best Active Ingredient Award in Silver; the active ingredient is said to have an effect similar to retinol. And Acnylis from Greentech uses the berries of the rose myrtle to help the skin produce less sebum which will then make skin look clearer. Remarkable were also the many ingredients that claim to offer a natural substitute for silicones, kationic emulsifiers or synthetic filming agents. Some of the ingredients I saw were described as even more effective than their synthetic equivalents. 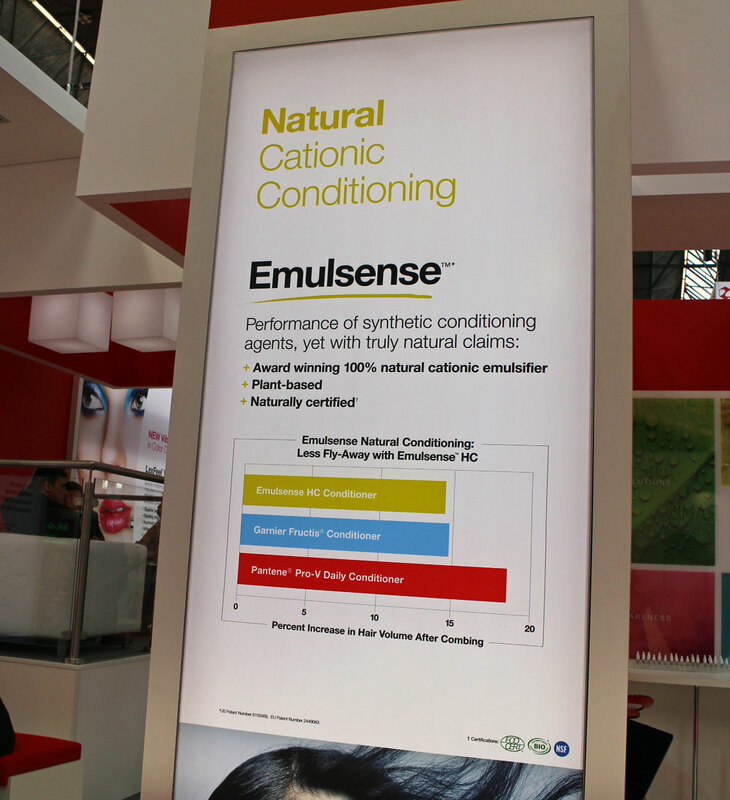 Emulsense from Inolex is a certified organic kationic emulsifier that is suitable for use in hair conditioners. The company also offers Lexfilm SunNatural, a natural filming agent for sun protection creams (to distribute the particles evenly and create a smooth comfortable texture). A natural version of volatile silicones (for makeup products, for example) was offered by Japanese company Nagase which presented a liquid wax called Esterol. In addition to these four trends I have outlined some of the raw ingredients that I noticed at the trade show – and which promise some interesting developments in the organic beauty industry. Mineral sun filters are not easy to formulate: they should not contain any nano particles and show only a little whitening on the skin. 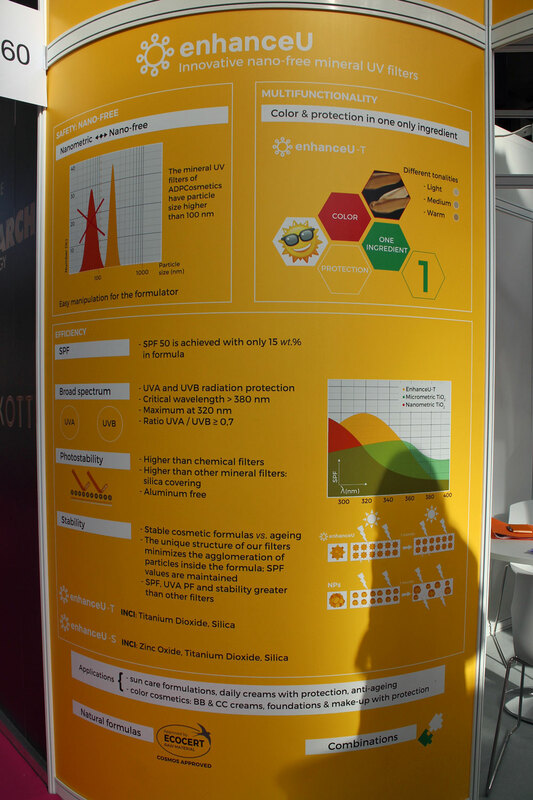 At the same time the sun filter complex needs to protect the skin against the entire spectrum of UV radiation whilst remaining as stable as possible. Spanish company ADP Cosmetics had a very busy exhibition booth and presented a whole range of different mineral sunfilters – which are obviously in demand (that was also the reason why I was there 😉 ). 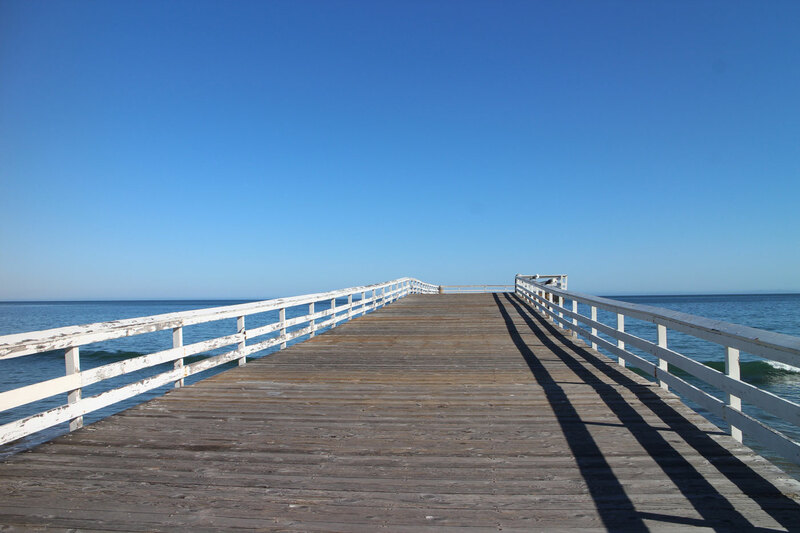 They use a special patented process to distribute the particles in a complex called EnhanceU which offers a higher sun protection without using nano-sized particles and with fewer particles in general. The particles are enveloped in silicium dioxide. This is a kind of preview because the ingredient won’t be available until June! 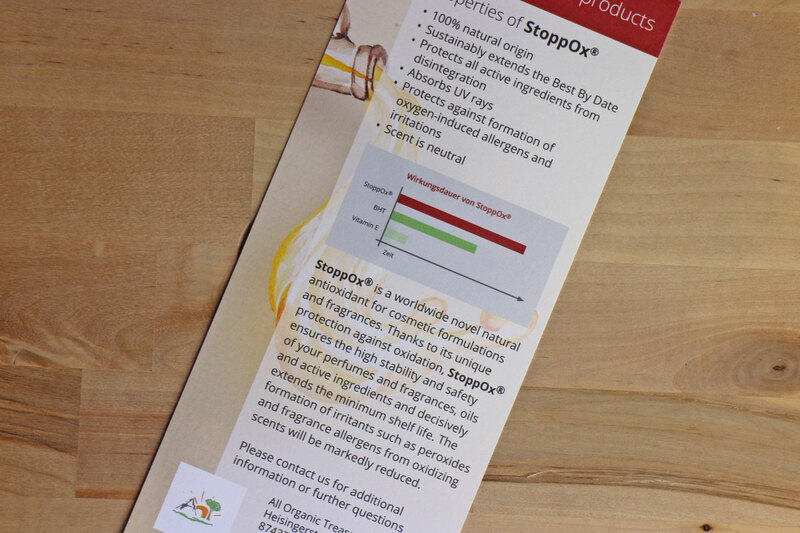 German company All Organic Treasures was looking for a way to prevent plant oils from oxidising so they teamed up with Dr. David Hauck and developed the ingredient StoppOx. This natural antioxidant protects oils, emulsions and perfumes effectively from oxidation. StoppOx is said to be much more effectiver than the commonly used vitamin E and even better than the synthetic antioxidant butylhydroxytoluol (BHT). The ingredient is currently undergoing Cosmos certification. 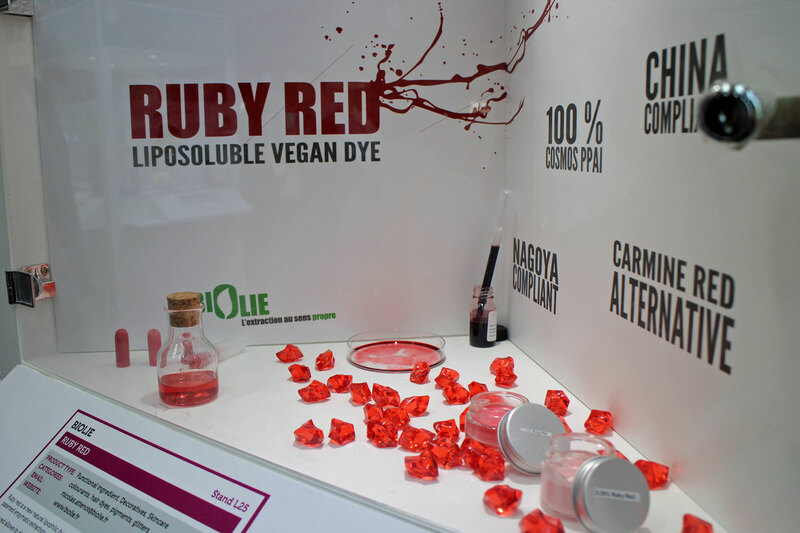 Ruby Red was presented as a non-synthetic and vegan alternative to the red colourant carmine – because achieving a stable red colour without carmine isn’t easy. French start-up Biolie uses enzymes to extract plant ingredients; in the case of Ruby Red the ingredient is derived from the alkanet plant. In the Makeup-Zone of In-Cosmetics I immediately noticed the Bioglitter Pure from Roland Britton. The British company actually won a Gold Award at the trade show – unfortunately my picture didn’t turn out well. BioGlitter Pure is 100% biologically sustainable and plastic-free; the glitter is manufactured from renewable raw ingredients (cellulose derived from eucalyptus). Bioglitter Pure will be available from September 2018. 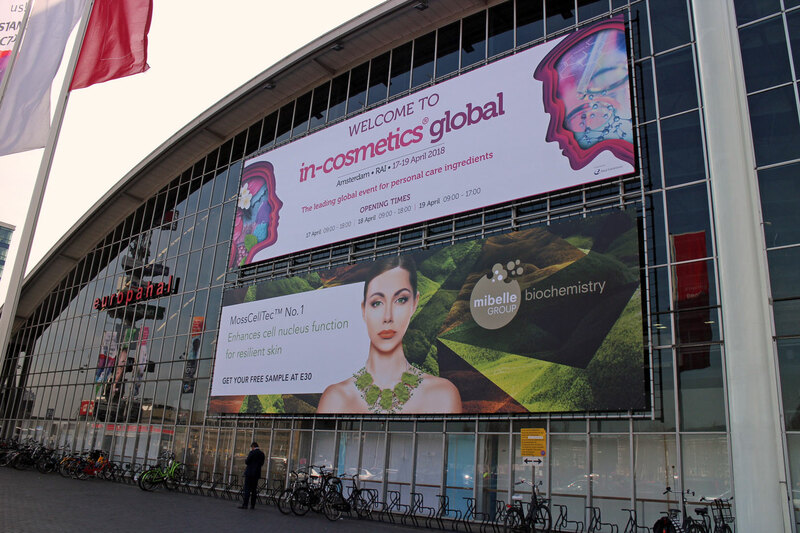 Right at the entrance of In-Cosmetics I noticed the huge poster which advertised the new ingredient MossCellTec No.1 from Mibelle Biochemistry. Of course I had to check this out more closely and asked the company to send me some information – the moss-derived MossCellTec No.1 caused quite a stir at the trade show and also won a Gold Award in the category Best Active Ingredient. MossCell Tech No. 1 is supposed to boost the vitality of the cell kernel so that the skin can more easily adapt itself to climatic or urban life conditions – much like the moss Physcomitrella patens has been doing for millions of years. Mibelle Biochemistry is calling this a new approach to anti-ageing. And another interesting ingredient! French manufacturer Alban Muller has been specialising in natural ingredients since 1978 and the company is an expert in organic ingredients. 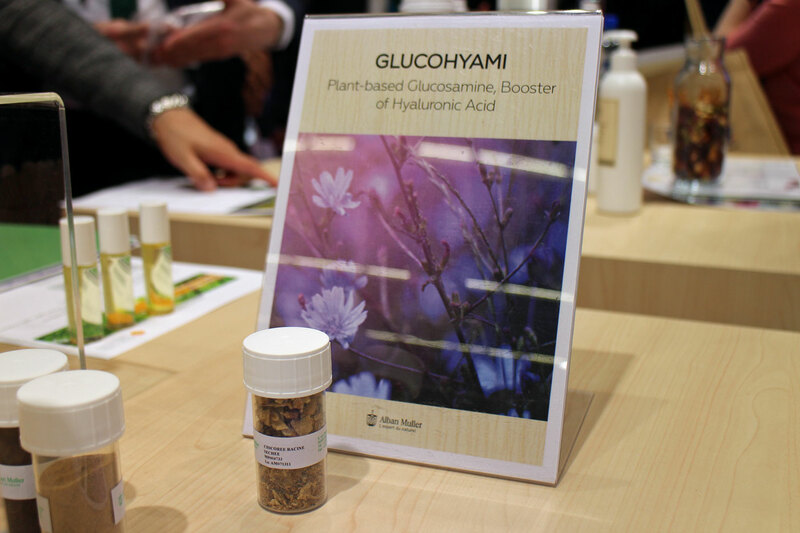 This year Alban Muller presented the new raw ingredient Glucohyami from Alban Muller at the trade show: The concentrated extract from the chicory root is rich in glucosamines and encourages the skin to produce its own hyaluronic acid, rather than simply adding hyaluronic acid to the outside layer of the skin. I really like these product concepts which support the skin in its natural functions – they‘re very exciting. Of course In-Cosmetics also presented classic raw ingredients such as plant oils! 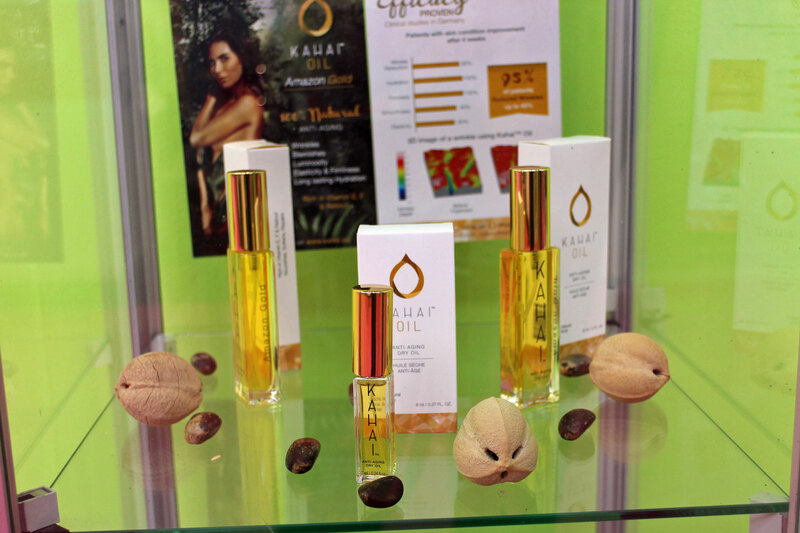 A few South American countries had a communal exhibition booth and there I discovered Columbian kahai oil (or: cacay oil) which is currently trending quite strongly in the international beauty world. Cacay oil contains a lot of linoleic acid as well as a high percentage of unsaponifiable ingredients which have an antioxidant and anti-inflammatory effect on the skin. Cacay oil is also said to have three times more transretinolic acid than rosehip oil (I’ve alread written about Cahay oil in this article here). Many raw ingredients companies also support cosmetics manufacturers with ideas for new product formulas. 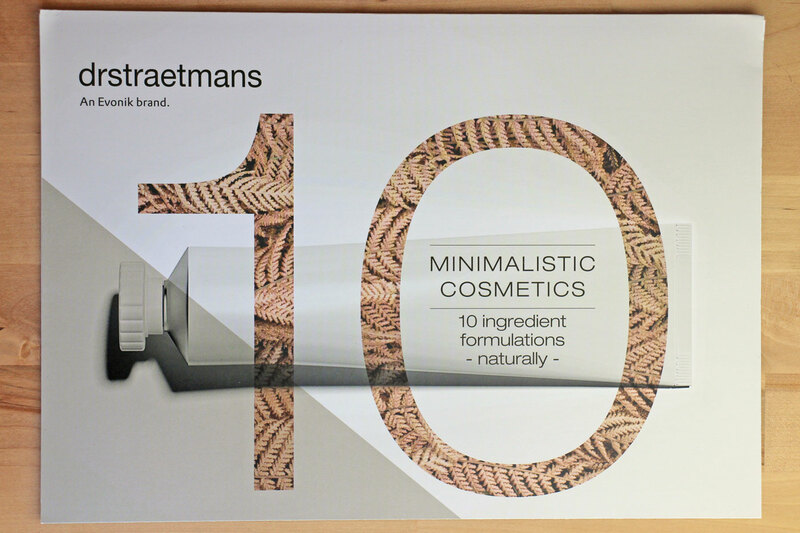 Dr. Straetmans from Germany is known for its alternative preservatives; at this year‘s In-Cosmetics the company introduced a new minimalistic formulation concept which contains a maximum of ten ingredients in each product. These minimalistic formulas only work when each ingredient has been carefully selected – ideally every ingredient should have more than one effect within the product. Minimalism doesn’t mean boring, by the way: the range offers emulsions, two-phase makeup removers and face toners. When I saw the plant sheet masks from Technature I immediately thought of the popular Real Kelp Sheet Mask from Korean beauty brand Whamisa! 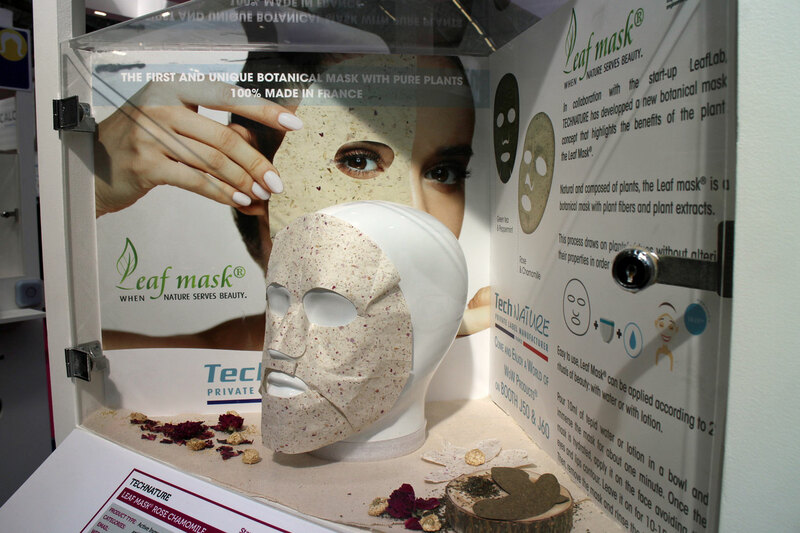 Technature is from France and presented two face masks which have a very similar concept: in the picture above you see a mask which is made from a blend of plant fibres, camomile blossoms and rose petals. You saturate the mask in a facial toner (or plain water) and then place it on the face. There is also a refreshing sheet mask variant which contains mint leaves and green tea leaves. And this is the end of my virtual walk around In-Cosmetics Global 2018. I’m excited to find out which ingredients will appear in new beauty products soon and I’m certain that the organic cosmetics industry will continue to see some exciting developments in the future. Because new raw ingredients also offer new product possibilities. It was my impression that raw ingredients manufacturers are increasingly thinking about the sustainability of their ingredients (if they are biodegradable, for example). I hope you enjoyed this glimpse into the world of organic product development! In cooperation with German organic brand Dr. Hauschka // This happens to me every year: in March it sometimes feels like winter will never end. All is grey and cold and everything seems to stand still. Of course that isn’t really true although it might seem so on the outside – however, underneath the earth everything is getting ready for spring and I greet every little harbinger with joy: the first snowdrops, the first aconites (which carry snow and winter in their German name: „winterlinge“), crocuses and narcissi. But it is only when spring has brought us the first few warm days that things really burst into bloom – and not just outside in nature but also inside, in myself. And I don’t mean the classic romantic spring feelings but rather an uplifting of the spirit and a fresh burst of energy. 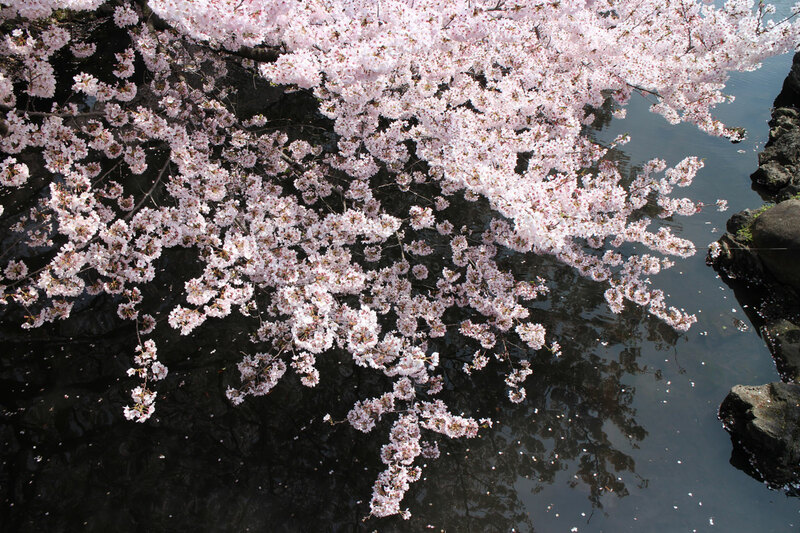 Every year spring gives me hope that everything can – and will – start anew. When the air is not longer icy cold when I throw open my windows in the morning. When the first blackbird is singing from the roof after a long winter. 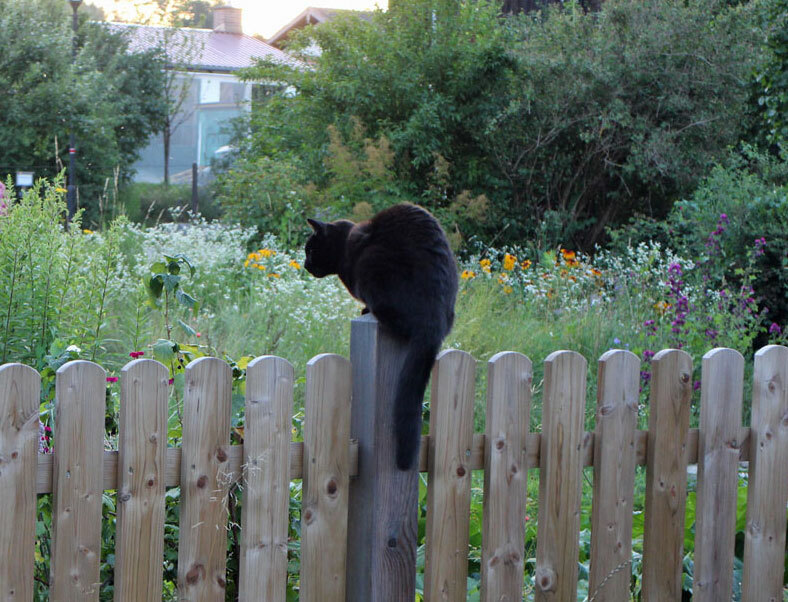 When it is already light before 7am and it stays bright until after 8pm. When the sun is shining on my desk again because it is already standing much higher in the sky. When it smells like rain for the first time. Suddenly long-buried images and thoughts are emerging in my mind: how long haven’t I heard a nightingale sing on a cool April evening! How beautiful are the blossoming sloe bushes I see outside; so much foamy whiteness! I dig through my wardrobe for a lighter jacket and even dare to pack away my winter boots and wintercoats. Finally there is fragrance in the air again: the little violets with their indescribably sweet perfume, the magnolia trees open their majestic blossoms, the pink cherry blossoms remind me of sakura time in Japan. 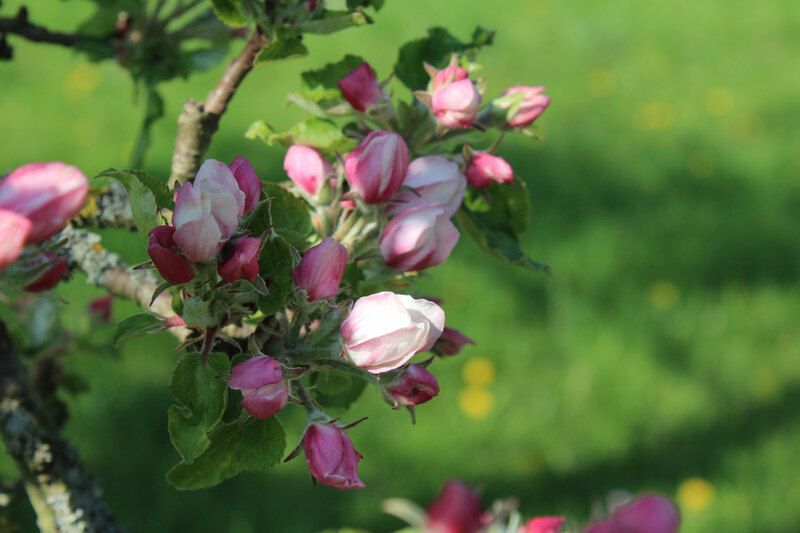 And once we are slowly moving towards summer the landscape turns an even more vivid green: it is the time of the apple blossom and finally the pear trees are blooming as well. 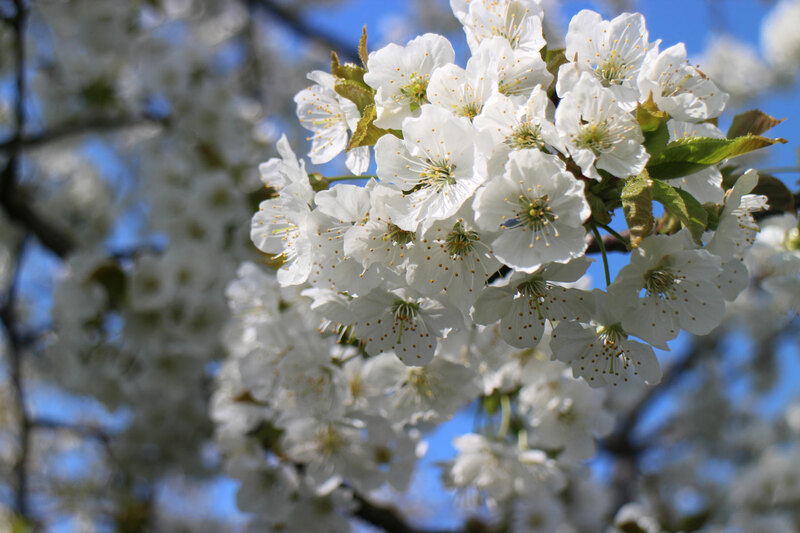 I love standing underneath these trees, listening to the bees humming and breathing in the sweet scent of the blossoms. What would it be like to once again go swimming in a cool lake, or spend more time outside? After all, summer isn’t that far away! Interestingly enough I always need a while until I have really shaken off winter and gotten used to milder temperatures again. And Dr. Hauschka’s Rose Day Cream Light always make me think of another kind of re-awakement: When the face cream was relaunched more than ten years ago I wrote about it – and this article, from 2007, was my very first online beauty article (the review appeared in an online magazine which I used to publish). It was a true premiere for me as well as a personal break-through: the first time I officially introduced my hobby – organic beauty – to the outside world. Of course I re-read my post from 2007 to see what I had written about the cream all those years ago – and phew, am I relieved that I used to pay attention to ingredients back then (although not quite as intensively as I do today). I can definitely live with that review! I gave the cream 8 out of 10 points – not bad, right? I particularly highlighted the pleasant texture and the high percentage of organic ingredients. It is really exciting to think that three years after these first online steps I launched my very own beauty blog – which has now become my profession. Who‘d have thought it?! And it is for this reason that in my mind the Rose Day Cream Light will always be associated with new beginnings and a personal and professional reorientation. 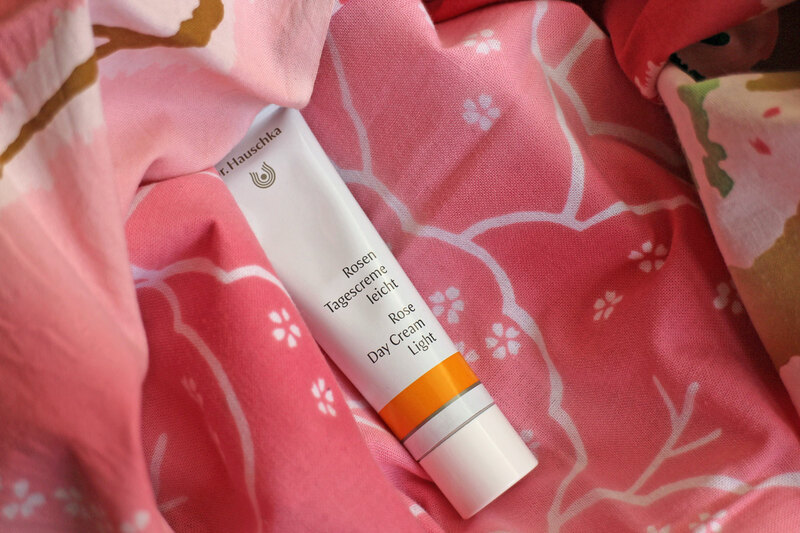 The Rose Day Cream Light is a less rich version of the classic Rose Day Cream from Dr. Hauschka. The Light cream focuses on hydration rather than protective lipids and waxes. However, the healing plant rose is still the focus and key ingredient in this moisturiser: the formula contains rose water, rose leaf and rose hip extracts, rose wax and Damascene Rose essential oil. Dr. Hauschka sources its rose essential oil from independent rose-growing partner companies in Ethiopia, Bulgaria and the Iran. With these partnerships the company not only supports the growth of organic agriculture in those countries but Dr. Hauschka also helps to create new jobs and to improve living and working conditions. 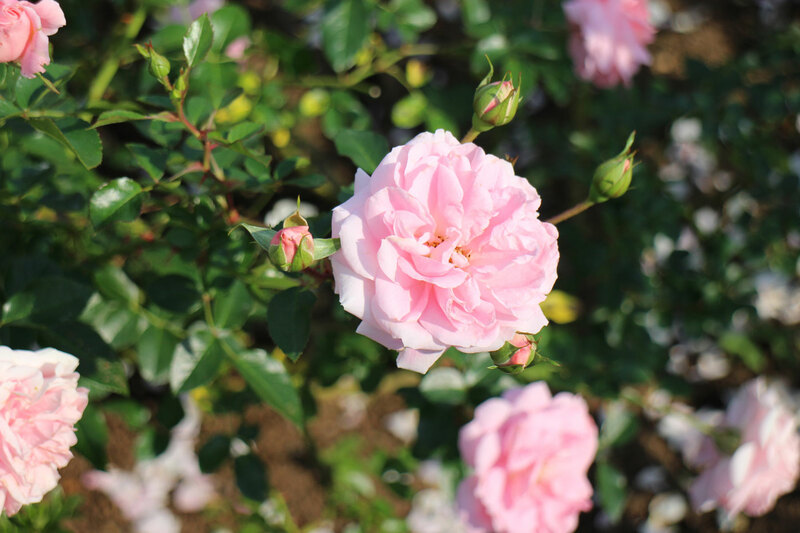 In the Rose Day Cream Light the essential rose oil certainly plays a leading role: not only is it responsible for the uplifting fresh rose fragrance but is also has anti-inflammatory and skin-regenerating properties. After I’ve cleansed my skin in the morning and patted on a layer of Dr. Hauschka’s facial tonic I apply the Rose Day Cream Light on lightly damp skin. The cream is easy to distribute and doesn’t leave any streaks and my skin feels somehow refreshed. I also like the typical rose fragrance. The cream is absorbed quickly into the skin but is still rich enough to leave a very soft (but not sticky) protective film – that’s probably the shea butter, beeswax and rose wax that is also contained in the product formula. The original Rose Day Cream has a much higher percentage of lipids and waxes than the lighter version and it is my impression that the texture of the light cream is more moist. 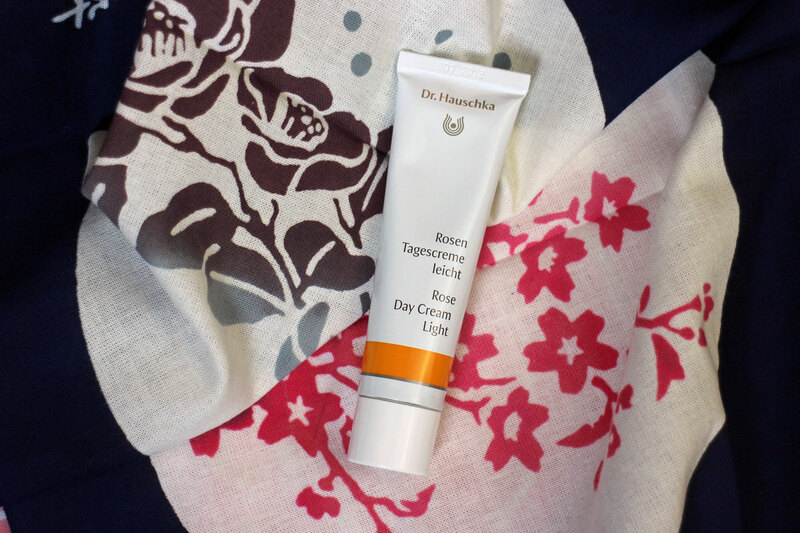 Dr. Hauschka recommends the Rose Day Cream Light for moisture-deficient skin. On my face the cream also works well as a base for makeup. The Rose Day Cream Light is based on water and sesame oil which has a high percentage of natural lecithin. This lecithin acts as a natural emulsifier and – in combination with avocado oil – helps to transport the hydrating ingredients deep into the skin. I also like the mallow root which is included as an extract in the cream: the mucuous substances and tannins from this root have a soothing effect on the skin, relieving skin irritation and inflammations. Mallow root is one of my favourite healing plants for the skin. Kidney vetch, one of the key plants in Dr. Hauschka’s beauty products, strengthens the skin when it is reddened or irritated. In Germany the Natrue-certified Rose Day Cream Light is available in organic supermarkets, department stores, pharmacies and all the usual online stores. A tube with 30ml costs 20.50 Euro. More information on the Rose Day Cream Light is available on Dr. Hauschka’s international homepage.